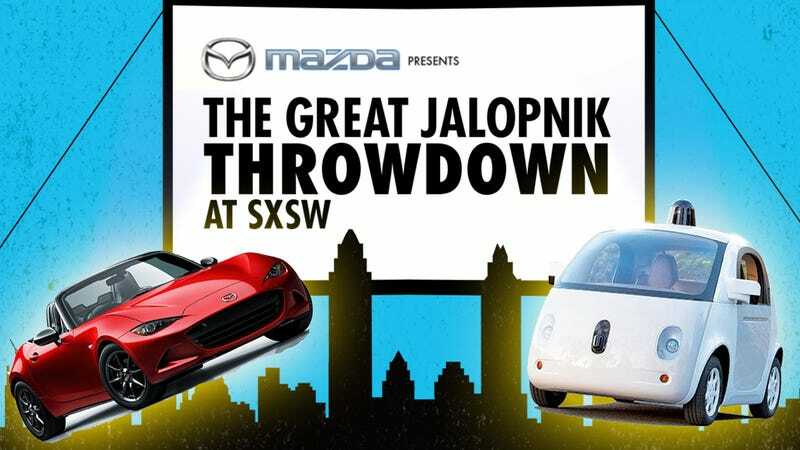 How would I describe The Great Jalopnik Throwdown At SXSW? It’s like a TED Talk, involving cars, but everyone took acid beforehand. And with a DJ and some really great music. You have to come, and you have to RSVP right away. Why come to our big SXSW panel? Because we’re going to have the most fun and passion-fueled debate over autonomous cars and the future of human driving that the world has ever seen. We’ll have a huge discussion on the cars of tomorrow and how enthusiasts fit into that. The folks at Mazda were kind enough to throw in for this throwdown, and it should be a blast. It’s Monday, March 14, from 6-10 p.m. at the Hype Hotel, 1100 E 5th Street. RSVP with this link. It’s FREE but you have to RSVP. Alex Roy: Former Jalopnik columnist, current Editor-At-Large at The Drive. Holder of multiple cross-country driving records. Inventor of the phrase “autonomotive singularity.” Bon vivant of speed, snazzy dresser. Gabe Klein: Forward-thinking entrepreneur and consultant in the technology and transportation fields, and all around fun guy. Former chief of both Chicago and D.C.’s transportation departments and a former executive at Zipcar during its pivotal years. Has a real job, unlike the other panelists. Alissa Walker: Friend of the site and urbanism editor at Gizmodo. Advocate for smarter, better city design and walking. Most likely a secret car enthusiast deep down. Stef Schrader: Amateur racer, journalist and Jalopnik’s motorsports editor. Advocate for Porsches and the Mitsubishi Lancer. Has the lowest press drive-to-crash ratio of any staff member. Jason Torchinsky: Jalopnik associate editor and mad genius. Air-cooled Volkswagen evangelist. Artist and classic video game enthusiast. Thought leader whose thoughts would drive most people mad. Parker Kligerman: NASCAR racer and NBC Sports Analyst. First-rate stick-shift instructor. Current points leader in the Camping World Truck Series. Exquisitely handsome. And I’ll be moderating the whole thing, possibly in a tasteful blazer/jeans combo. Best of all, we’ll have a DJ set by electronic musician and actress Taryn Manning, known for her role on Orange Is The New Black and for her sick beats. You’re coming, right? It’s going to be insanely great.